Taos Rock has over 300 days of sunshine a year. Northern New Mexico offers mild winters, cool summers, and unrivaled sunsets and panoramic vistas. Crank steep bolted cobbles amid the pine forests of El Rito. Sample the splitter cracks and bolted basalt of the Rio Grande Corridor. Multi-pitch trad climbing provides day-long adventure on Questa Dome. Many fine bouldering areas serve as destinations or quick fixes. Tres Piedras, Cimarron, and Comales Canyons, round out the offerings. Free camping, hot springs, and uncrowded cliffs combine with Southwestern charm to make Taos Rock Climbing the ultimate Four Corners climbing destination. Taos Rock, Sharp End Publishing (2005). 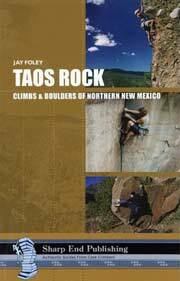 Contact Mountain Skills to order a copy of Taos Rock! 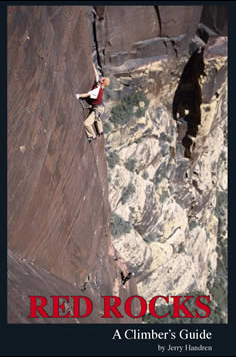 This is a comprehensive guidebook to the rock climbs found in Red Rock Canyon National Conservation Area, twenty miles to the west of the Las Vegas strip in Southern Nevada. Nevada’s Red Rock Canyon offers the climber everything from sport routes and bouldering to big aid walls and long free routes. The reliable weather, beautiful surroundings and great climbing make Red Rocks one of North America’s most popular destinations during the fall, winter, and spring. 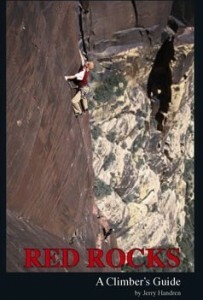 This Red Rock climbing guidebook provides detailed information on over 1700 rock climbs, using full written descriptions, maps, topos and photo diagrams. It includes a substantial number of climbing routes not found in previous guidebooks. It also expands on the descriptions and topos of many of the older routes and attempts to correct many lingering errors. In compiling the route descriptions for both new and older climbs, I have tried to use recent, first-hand experience as much as possible. Many descriptions were culled from various Red Rocks locals within a few hours of an ascent. Also, in researching this book, I climbed hundreds of routes myself in an attempt to make this the most complete, detailed, and accurate Red Rock Canyon guidebook to date. The Red Rock guidebook is full color and printed on high quality coated paper to ensure crystal clear photographic reproduction. The binding is sewn/ saddle stitched to ensure excellent durability. To provide historical background I have included a history, written with Larry DeAngelo, and also essays by Joanne Urioste, John Long and Larry Hamilton. To give a feel for the spectacular rock climbing there are over 60 action shots spread throughout the text, many featuring routes that have never appeared in print before. use your hands and feet to move up the cliff using various combinations of push, pull, momentum, and balance. Chapters concentrate on highsteps, side pulls, laybacks, stemming, barndooring, cracks, finding rests, swapping hands and feet, mantles, roofs, using momentum, and dihedrals. It also has two chapters on gripping the rock. 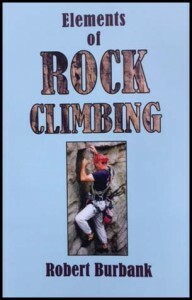 The intent of this book is to explain how to actually climb, not how to use gear. The book uses stairs to explain certain moves allowing the reader to experience these moves at home. Other explanations are supported with diagrams. Key points are separated out for emphasis. Appendices describe the climbing process, a few thoughts for the new leader, analysis of climbing forces, and a glossary of terms.